We ate at Gourmet House with Mr. Monkey's family today. I found the sign rather entertaining and was very interested in finding what exactly made this place "more than a steakhouse." 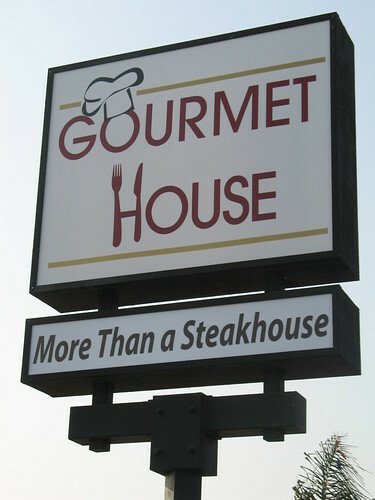 I am sad to say that, not only was Gourmet House not "more than a steakhouse," but it wasn't even a decent steakhouse. But what do you expect from a place that used to be a Spike's Teriyaki Bowl? 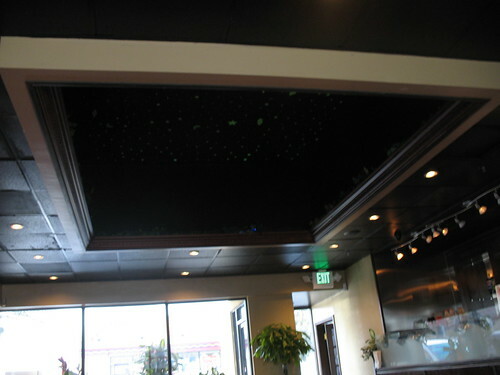 The restaurant's ceiling had glow-in-the-dark stars. I don't even think that needs a snide comment from me. I am sure you are already thinking of one yourself. 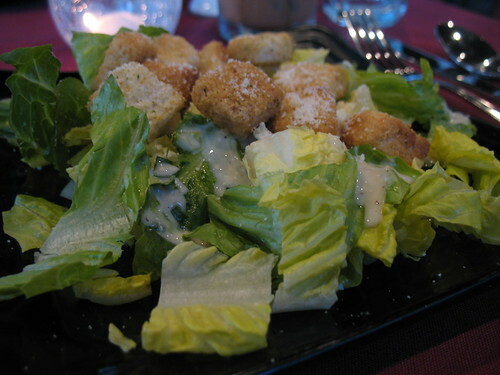 Caesar salad. Nothing very exciting. 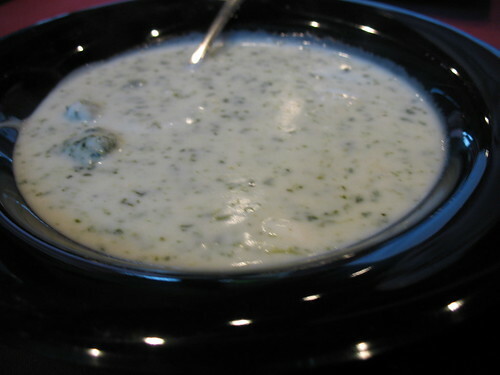 Lobster-spinach soup. Bland and gross. Should be called "flavorless spinach mess with little to no lobster." 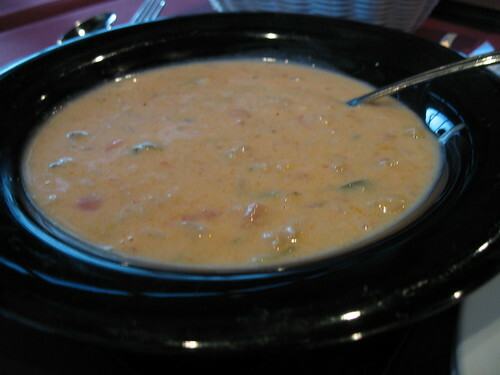 Manhattan clam chowder. Totally wrong, wrong, wrong. Manhattan clam chowder should have a tomato-based broth. This was like a New England clam chowder with ketchup in it. 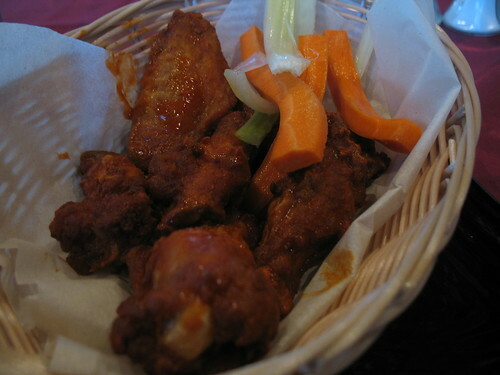 Hot wings. Not bad. One of the better offerings. 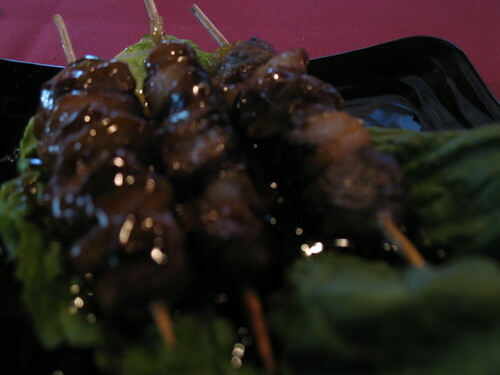 Beef kabobs. 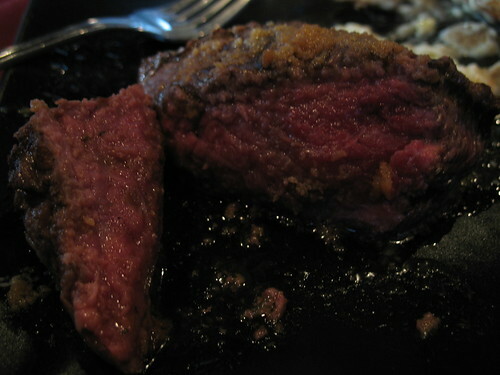 Chewy, poor quality meat. 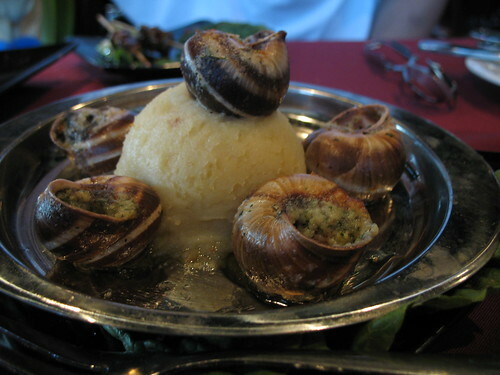 Escargot. Chewy, poor quality snails. 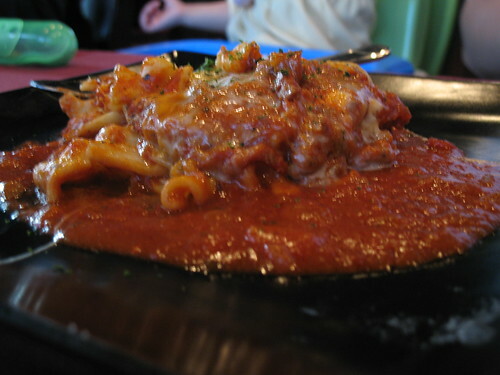 Lasagna. Didn't have any, but it looked overly sauced. 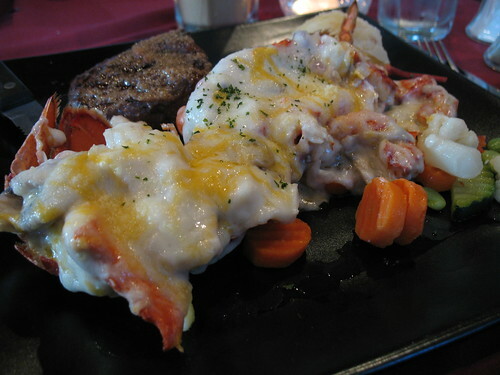 Lobster thermidor and filet mignon combination. The lobster thermidor was chock-full of mushrooms, rather than lobster. Very disappointing. My sister-in-law sent her "medium-well" steak back to be cooked some more. It practically mooed at her. 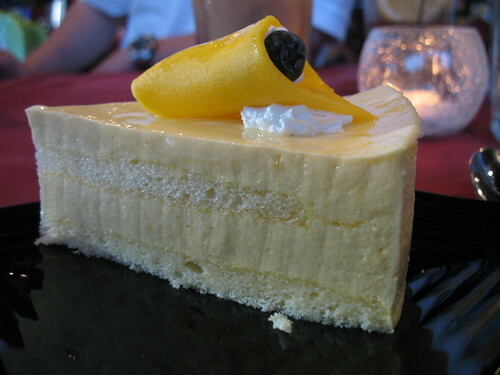 Mango mousse cake. Sadly, it looked prettier than it actually tasted. 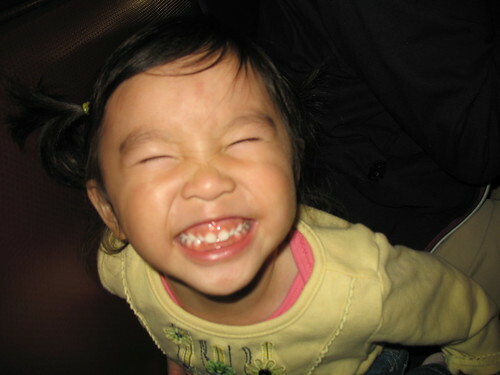 What would a post about Mr. Monkey's family be without pics of Little Monkey Niece? LMN's new favorite thing is doing her "crazy face" in pictures. She is quite the chatterbox these days. I must admit now that this kid's got potential. She is rather zany, which amuses me in light of the fact that her parents are the absolute opposite of zany. Gourmet House is the absolute opposite of gourmet. To make a bad meal worse, I had...um...problems when I got home. Never. Going. Back. boo to getting sick, that blows (no pun intended)! LMN is cute, but I'm going to say it's nice to view her in 2D and not the 3D version with sound. Boo on Gourmet House! Ever since my bout with food poisoning, I will no longer eat at questionable places. Sorry the food was crummy. Yeeesh the picture's didn't even look appetizing.. and you know me! I'll eat anything <--chubster. Does LMN look like Mr. Monkey's own offspring to you? I suppose that's not so far off given that he's her uncle - but those two are really starting to look alike! Boo to the bad food! ugh that food. HATE problems from bad food. At least with good food it was good going down. But your photography is pretty. 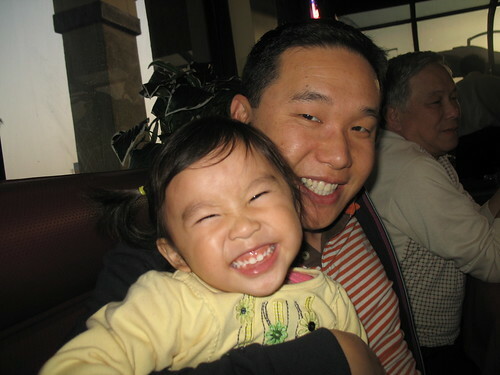 And little monkey niece is mr. monk with pigtails. hilarious! LMN does look quite like mr. monkey. meh to gourmet house. Crazy face - love it! She makes me want to be a kid again. The food doesn't look so bad, but then again I don't have very gourmet taste. i'm glad LMN is coming around though. yay! That food looks disgusting, but I must admit that the glow in the dark stars are what get me. Are they serious?!? I'm lovin' LMN's crazy face. It is zany. :) Sad about the craptastic food though. That is not nice of them to tease gourmet and provide gour-blah. i LIKE spike's teriyaki. i bet it wouldn't have given you the cha-cha-cha.